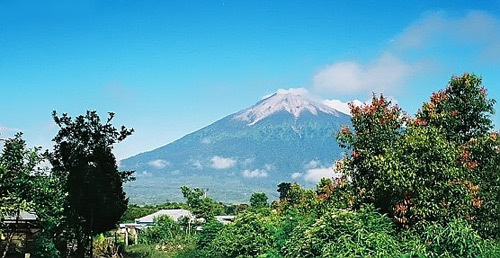 Kerinci Seblat National Park is one of the largest national parks in Indonesia. Kerinci Seblat protects almost 14,000 sq kilometres of tropical rain forests in central western Sumatra running down the Barisan mountain range and its foothills and covering parts of four provinces. The terrains varies from lowland forests up to the peak of mighty Mt Kerinci at 3,805 m. This national park is a UNESCO World Heritage Site as part of the Rainforest Heritage of Sumatra and one of the most important tiger reserves in the world. The park is dominated by the Barisan mountains. Scenery in many areas is very spectacular with active and dormant volcanoes including Mount Kerinci, at 3805m the highest mountain in Sumatra and Indonesia's highest active volcano. The national park forests protect the headwaters of some of Sumatra's most important rivers which flow from springs and peat swamps like Ladeh Panjang (Kerinci district) and Danau Kebut (Merangin district) high in the mountains, as well as many lakes and wetlands. The Great Sumatra Fault runs through the centre of the national park and forms the densely populated Kerinci valley, which lies in the middle of and is surrounded by national park forests. Types of flora protected in TNKS include Kantung Semar (Nephents Ampularia), orchids, and tropical trees among others. Types of fauna protected include Sumatran Tigers, bears, deer, various primates and birds among others. Types of endemic primates protected in TNKS include Simpai, Ungkou, Siamang (Symphanlangus Syndactylus), monkeys, and long tail monkeys among others. Types of birds protected include Rangkong, Tohtor and Kuau birds and eagles among others. Most of these fauna are endangered species. Most visitors arrive from Padang's Minangkabau International Airport which offers quickest access for the Kerinci area of the national park, which takes 7 hours, with daily flights from Kuala Lumpur, Jakarta, and Medan. However there are alternatives: Jambi with flights from Batam, Jakarta, and Palembang is around 5 or 6 hours to Bangko, and 8 hours to Kerinci if the roads are good. Bengkulu airport (domestic flights from Jakarta) is better for visits to North Bengkulu (elephants) and the Curup area of the national park (rafflesia). The transportation costs between Padang and Kerinci run about 130,000 IDR for a seat in a shared taxi, with fixed departure times of around 9am and 7pm. A private car and driver costs around 900,000 IDR including gas, with flexible departure times. There is an airstrip in Kerinci with flights to and from Jambi city airport: Susi Air flies four times a week on Monday, Wednesdays, Fridays, and Sunday mornings. Tickets are around 330,000 IDR. However, it is not the most reliable, and is frequently cancelled or delayed without notice. So be sure your schedule isn't tight on the other end if choosing this method. You may want to call your hotel or homestay in advance to arrange for personal transport (you can hire a car, van, or bus) for your trip, however there are good 'Travel' minibus and Share Taxi services from Padang and Jambi and Bengkulu to district capitals which border the park. Padang to Kerinci (Sungaipenuh) or Bangko (Merangin district) is a six-seven hour bus drive, Jambi city to Bangko five hours, Bengkulu city to Curup three hours while it is four hours to the elephant sanctuary at Seblat from Bengkulu city. Arrival at Padang airport (Minangkabau) is 'ordeal by taxi driver' (taxi fare from the airport to Padang is around 100,000 IDR) - better to take the airport DAMRI buses into town, overnight in Padang and then head for the park. Your hotel should be able to help with Travel/shared taxis to Kerinci. Some guides and travel companies like Wild Sumatra (wildsumatra.com) can help arrange pickup directly from the airport. It is also possible to take public buses or local angkot minibuses. Be prepared for an uncomfortable ride though as public buses are often crowded, may not have enough space for bulky luggage, and they make frequent stops. However for getting around locally, angkot minibuses are inexpensive and convenient - around 10-15,000 IDR for the hour long ride between the Kerinci towns of Kersik Tuo and Sungai Penuh. Just try to avoid the back seat, or you will be scrunched up the whole time.